When will he approach me personally? As querent and ruler of 1st house I am Venus - which is rather fitting as Venus is conjunct my natal ASC. He, as quesited, is the ruler of 7th house and therefore Mars (only traditional rulers in horary after all), and Mars is in Aries. Venus, as you can see, is very interested in that question and in the approach, as Venus is sort of in his 1st house. There is no strong reception as far as I can see it. Venus is ruled by and also in the term of Jupiter, so actually Venus is mightily interested in whatever Jupiter represents. Mars is in Aries and therefore pretty much interested in himself. lol Mars is in the detriment of Venus but also curiously enough in the terms of her. But anyway, the orb is 2 degrees, and I have often found that to be literal in horaries, so IF this is a valid horary and there will indeed be an approach, it will take place in a time unit of 2, 2 days or 2 weeks or 2 months. 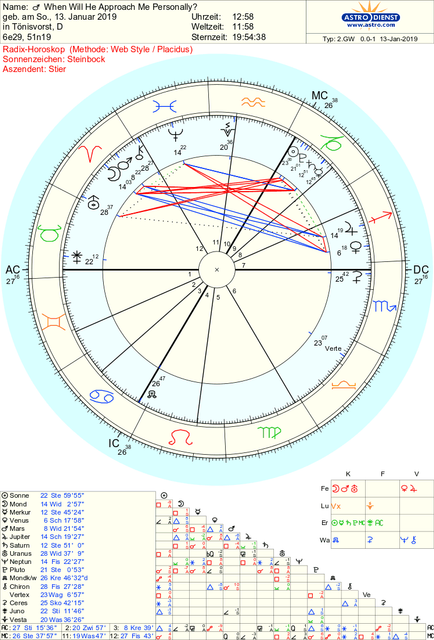 Also always important to check the MOon as this is about the course of events, here Moon is in Mars-sign, interestingly enough, and it is EXACTLY trine Jupiter, so another hint (with a flagpole actually. lol) at Jupiter. Hmm Jupiter rules the 8th house and the 12th house. I am not sure what that means though. What that could have to do with the question, but since Jupiter is mentioned so much here, I suppose there is something about it, some secret? Something I am not quite seeing even though it is basically right in my face? But anyway mostly sharing this, cause yes I think this is a horary which is a Yes-answer, there will be some sort of approach/ connection, and it will happen in a timeunit of 2. So I am using this as a learning tool, and if it will not happen, then I will get back to the drawing board and modify my approach to horary. Very good analysis lucina ! Just one thing, when a planet is inside a house but in a different sign; the effect is weakened. So although you are in HIS house; your effect is not there due to the sign difference. This might translate to what you said in your analysis. "Venus is applying to a trine to Mars - so there seems to be a meeting/ approach, but since Venus applies to Mars, I guess it will be Venus (me) making the connection. Even though I really cannot see myself doing that. lol "
So the thought remains a thought and not an action. thank you. Interesting observation. Well so far I have not observed that myself, but will keep my eyes open about that, and in my personal case here it makes of course a lot of sense. lucina, please come back here and tell us the result!